We’d love your help. Let us know what’s wrong with this preview of Fairytale Shifters by Sean Michael. Giraffe has lived his entire life as an attraction at the zoo, mov When Guerilla Contracting is called out after hours to deal with electrical problems at the circus, gorilla shifter Joe expects to encounter animals in cages. He doesn’t like it, but knows it’s part of the territory when it comes to circuses. What he doesn’t expect to find is a naked man in the giraffe cage. To ask other readers questions about Fairytale Shifters, please sign up. Oh man, this was weird but I'm still totally going to read the next one. The Rapunzel reference was a stretch, but you really have to toss logic off the top of a very tall building before you read these anyway. So what the hell, toss the logic and embrace the weird. Just like Rapunzel of fairy tale fame grew up alone, locked away in her tower, Rafe the giraffe shifter has been isolated all his life because a circus boss decided he wanted him to remain in his animal form all the time. That way the circus makes more money. But then gorilla shifter Joe discovers him and, angry at the selfishness of the circus owner, offers Rafe a choice. Rafe is curious and not averse to having an adventure, so he happily follows Joe into the unknown. 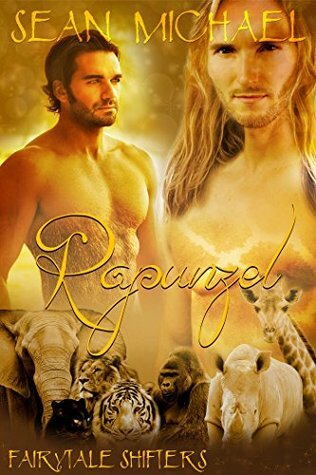 They embark on a wonderfu Just like Rapunzel of fairy tale fame grew up alone, locked away in her tower, Rafe the giraffe shifter has been isolated all his life because a circus boss decided he wanted him to remain in his animal form all the time. That way the circus makes more money. But then gorilla shifter Joe discovers him and, angry at the selfishness of the circus owner, offers Rafe a choice. Rafe is curious and not averse to having an adventure, so he happily follows Joe into the unknown. They embark on a wonderful journey of discoveries, and Rafe soon finds out that it’s a lot more fun to be outside the cage than locked inside it. Joe cannot believe that someone is forcing a shifter to remain in his animal form all the time, just to make money. Essentially, to him, Rafe is a prisoner, and Joe suspects some of the other circus animals may be in the same situation. But his focus is Rafe, and he is ecstatic when he manages to coax the gentle man out of the cage that is all he knows. Joe is determined to teach Rafe about choices, and sets about to show him that there are more things to eat than celery. I loved their food adventures! Rafe is initially very confused. He has been taught it is bad to be in his man shape, yet Joe seems to be okay with it. He has never had anything other than celery to eat, so all the other vegetables and fruits delight him. A shower meant being hosed down by cold water, so imagine his surprise when he learns there are warm showers – and soap! Rafe is also scared of being “out there” in the world, because he doesn’t know the rules – and from what Joe tells him, they are very different from what Rafe was used to in the circus. But Joe makes him feel safe, and he likes “sharing pleasure” with the man, so he ignores his fears and jumps right into learning what it’s like to be a man full-time. If you like fairy tales without angst and lots of gentle first experiences, if two very different shifters who seem made for each other are your thing, and if you’re looking for a gentle love story with lots of funny and tender moments, then you will probably like this short story. I adored it! I'm confused. ..I don't understand the Rapunzel reference at all. The characters were likeable but there wasn't much going on. it was very short which isn't necessarily a bad thing but it was so short that the story felt rushed. The ending especially felt rushed to me. This review has been hidden because it contains spoilers. To view it, click here. Sean Michael is usually one of my go-to authors, but this book really didn't hit the spot. There were too many unknowns and loose ends for me. One minute Joe is working at a circus trying to get their electrics right, when he discovers the Giraffe is a shifter and he wants to release him. Fine, but after that it all went wrong, suddenly, Joe isn't going home or finishing his work even, he's driving off unexpectedly to live elsewhere in the country - as if people won't find that wierd. On top of t Sean Michael is usually one of my go-to authors, but this book really didn't hit the spot. There were too many unknowns and loose ends for me. One minute Joe is working at a circus trying to get their electrics right, when he discovers the Giraffe is a shifter and he wants to release him. Fine, but after that it all went wrong, suddenly, Joe isn't going home or finishing his work even, he's driving off unexpectedly to live elsewhere in the country - as if people won't find that wierd. On top of that instead of working, he's going to be living off a nest egg and looking after a missing giraffe shifter he suddenly calls Rafe, without any apparent discussion. It just felt as though either too much had been edited out to fulfil a word limit, or else it had been thrown together from a couple of ideas. Like the first book in this series, this book was an amazing read. I love how Joe instantly cares for "Rafe" the Giraffe and wants to help and take care of him. To see how Rafe has to learn nearly everything what's outside of his cage is kind of sad. But the way how Joe cares is adorable. But will it be enough that Rafe wiöö stay with the Gorilla? Find out yourself, it's sooooo damn worth it. Very cute. Very sudden, but still very sweet. I liked it, but it ended too abruptly with none of the external conflicts resolved.